TuTu loves baseball. He loves baseball so much he wants to start his own team with all of his Swamp Kids friends! But they need a little help getting ready. When the big game finally arrives, the opposing team is more than TuTu had bargained for! Will they be ready and win the game? Find out as they romp through another fun-filled adventure in the sixth book of The Adventures of The Swamp Kids series! Play Ball's Lagniappe Lesson at the end of the story also hits a big home run by featuring Louisiana State University head baseball coach Paul Mainieri who tells readers of the importance of good sportsmanship, working hard and playing any sport they love to the best of their ability. Readers will also enjoy our interactive page with a traditional sing-along of "Take Me Out to the Ballgame". The Swamp Kids are celebrating Mardi Gras! 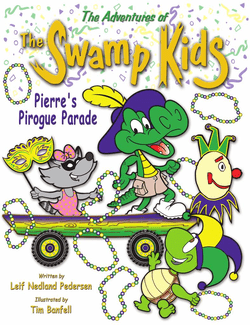 In this fifth installment of The Adventures of the Swamp Kids, you and your family can join Mon Cher and Pierre as they rally their friends on Bayou Bleu to form their very own Mardi Gras krewe and create special costumes and floats in their own unique way. Pierre's Pirogue Parade is all that Mardi Gras should be... and following their tale, Mardi Gras author, TV personality and historian, Arthur Hardy, gives the young readers, teachers and parents insight into the history and tradition of the centuries-old celebration. Ayeeeee, Mon Ami (My friend)! Take your child on a musical adventure with new, lovable swamp characters when you order our first book, The Missing Chord, from The Adventures of the Swamp Kids series, ideally structured to kindle the imagination of the 4-10 year-old age group (PreK-Grade 3) as well as children looking to enhance their reading skills. ​Join Pierre a le Gator, Mon Cher the pretty raccoon and TuTu the playful turtle as they embark on their first swamp adventure, The Missing Chord. While practicing to compete in the Fais Do-Do for Best Band in the Land, the kids discover that something is missing from their sound. It takes a shy new friend to solve their mystery which he does in a most unusual way. Contains a Lagnaippe Lesson by Cajun fiddler, Doug Kershaw, to further explain the moral of the story and an activity page the whole family can do together to enhance the reading fun! The Missing Chord magically blends music with reading and encourages children to step out of their comfort zone and try something new. ​Winner of the 2015 National Mom's Choice Award! The fun has only started! Just in time for the holidays comes TuTu the Turtle, wanting to surprise the Swamp Kids with their very first evergreen Christmas tree in our newest book,TuTu's Christmas on the Bayou. Join him as he ventures out of Bayou Bleu on an adventure of his own that takes on some surprising twists. You'll learn how important the meaning of friendship is to his friends, Pierre, Mon Cher and two new characters, Plauche' the Near-Sighted Pelican and Lafleur the Punk Skunk. It's an adventure you will want to add to your Swamp Kids (and holiday) collection with many more to follow. Now comes a special spring release with the third book in the series, A Zoo Ta-do! 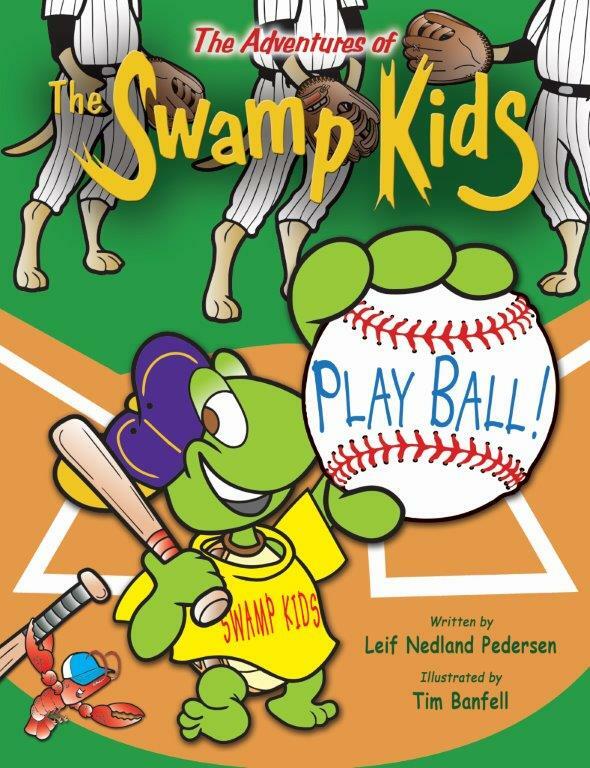 This comical adventure follows the Swamp Kids as they recount their recent trip to Audubon Zoo. Once again, illustrator, Tim Banfell, adds his magical touch to the illustrated characters. Joining Leif and Tim in this book is New Orleans TV news anchor, John Snell, who lends his beautiful photographic interpretation to each page of the storyline. The book also contains its traditional Lagniappe Lesson at the end of the story, this time penned by Audubon Zoo President & CEO, Ron Forman, who encourages all children to explore the world around them by visiting their local zoo, aquarium or other nature-inspired attractions. ​This is a great book to read before OR after a visit to the zoo! The fourth book in the Swamp Kids series, A Dog Named Cat is a wonderfully touching adventure, that follows the “Kids” as they travel to a nearby animal shelter where they find and adopt a new pet, a Louisiana Catahoula Cur puppy! Leif and Tim join talents to bring children the magic of this story about pet ownership. The Lagniappe Lesson deals with the care and responsibility involved with pet ownership and is supplied by WWL-TV and Radio personality, Angela Hill, a dedicated animal lover respected for her journalistic talents and her unwavering commitment to animals. A great book for animal lovers everywhere!